MANILA, Philippines – It was a scene straight out of an action movie. 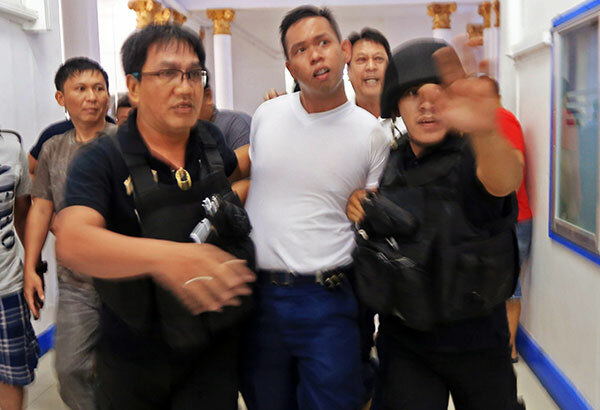 A rookie policeman that was high on drugs brandished his service pistol inside the MPD (Manila Police District) Headquarters and threaten anyone who stood in his way, while the Special Weapons and Tactics team encircled the building to neutralize him. After several tension-filled minutes and gunshots fired, Police Officer 1 Paul Vincent Solares was cornered by his colleagues yesterday on the second floor of the MPD building, a few meters from the office of incoming district director Chief Superintendent Napoleon Coronel. Based on investigation, Solares, who is detailed at the MPD-station 11 in Divisoria, initially went to Station 4 in Sampaloc at around 02:30 PM yesterday, 03 July 2016 and reportedly threatened to kill everyone he saw wearing Manila Mayor Joseph Estrada’s signature orange T-shirt. A minor who went to the headquarters to file a complaint after the incident said the suspect manhandled him before firing several shots in the air. PO1 Solares, who was in uniform, then rode his motorcycle and proceeded to the MPD headquarters along UN Avenue at around 03:00 PM. He saw Solares and another policeman pass his table, even greeting him, said PO2 Billy de la Cruz, who was assigned at the lobby desk of the MPD. A few seconds later, PO1 Solares started cursing and breaking the framed photos of City Mayor Erap Estrada and outgoing district director Chief Superintendent Rolando Nana that hung on the wall by the stairs leading to the second floor. Then he fired two shots, alarming the police personnel on duty. De la Cruz drew his firearm and positioned himself near the main door, while homicide investigator PO3 Joselito Lopez rushed out after he heard the commotion. The two were joined a few minutes later by SWAT personnel, who ordered the lockdown of the whole facility. As the SWAT team was moving in, and after two more shots were fired, PO1 Solares surrendered. During investigation, the suspect, who was visibly high on drugs, said he wanted to kill Estrada but did not say why. He then asked for a lawyer and said he would not say anything more. Coronel ordered a thorough investigation of Solares’ action and the immediate filing of charges against him.